This small sparsely branched herb grow to about 40 cm tall. 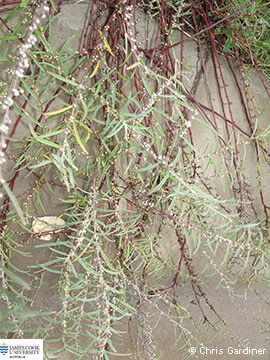 Leaves linear 10-45 mm long and densely covered with whitish branched hairs. Flowers pea-shaped borne in a short spike, standard about 2.5 mm long pinkish red, keel petals are red. Pods are globular to 2 mm diameter and covered in whitish hairs, each pod contains a single seed. Palatable.